A broad effort is underway to improve the sensitivity of nuclear magnetic resonance through the use of dynamic nuclear polarization. Nitrogen-vacancy (NV) centers in diamond offer an appealing platform because these paramagnetic defects can be optically polarized efficiently at room temperature. However, work thus far has been mainly limited to single crystals because most polarization transfer protocols are sensitive to misalignment between the NV and magnetic field axes. Here we study the spin dynamics of NV-13C pairs in the simultaneous presence of optical excitation and microwave frequency sweeps at low magnetic fields. 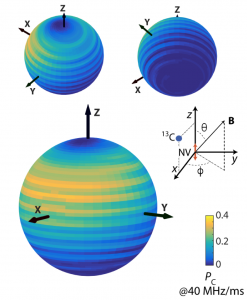 We show that a subtle interplay between illumination intensity, frequency sweep rate, and hyperfine coupling strength leads to efficient, sweep-direction-dependent 13C spin polarization over a broad range of orientations of the magnetic field. In particular, our results strongly suggest that finely-tuned, moderately coupled nuclear spins are key to the hyperpolarization process, which makes this mechanism distinct from other known dynamic polarization channels. These findings pave the route to applications where powders are intrinsically advantageous, including the hyper-polarization of target fluids in contact with the diamond surface or the use of hyperpolarized particles as contrast agents for in-vivo imaging.